Just like a bar magnet, Earth has a magnetic field surrounding it and two magnetic poles.The fact that Earth has a magnetic field explains why a compass works as it does. The poles of the magnetized needle on the compass align themselves with Earth’s magnetic field. Earth’s magnetism is still not completely understood. But scientists do know that the circulation of molten material in Earth’s core is related to Earth’s magnetism. You know that Earth rotates on its axis, around the geographic poles. But Earth also has magnetic poles. These magnetic poles are located on Earth’s surface where the magnetic force is strongest. The magnetic poles are not in the same place as the geographic poles. For example, the magnetic pole in the Northern Hemisphere is located in northern Canada about 1,250 kilometers from the geographic North Pole. If you use a compass, you have to account for the fact that Earth’s geographic and magnetic poles are different. Suppose you could draw a line between you and the geographic North Pole. The direction of this line is geographic north. Then imagine a second line drawn between you and the magnetic pole in the Northern Hemisphere. The angle between these two lines is the angle between geographic north and the north to which a compass needle points. This angle is known as magnetic declination. So, magnetic declination differs depending on your location on Earth. The magnetic declination of a location on Earth today is not the same as it was 10 years ago. The magnetic declination of a location changes. Earth’s magnetic poles do not stay in one place as the geographic poles do. Figure 13 shows how the location of Earth’s magnetic pole in the Northern Hemisphere has drifted over time. You learned that a material such as iron can be made into a magnet by a strong magnetic field. Since Earth produces a strong magnetic field, Earth itself can make magnets out of ferromagnetic materials. Earth’s magnetic field also acts on rocks that contain magnetic material, such as rock on the ocean floor. Rock is produced on the ocean floor from molten material that seeps up through a long crack in the ocean floor known as a mid-ocean ridge. When the rock is molten, the iron it contains lines up in the direction of Earth’s magnetic field. As the rock cools and hardens, the iron is locked in place. This creates a permanent record of the magnetic field. As scientists studied such rock, they discovered that the direction and strength of Earth’s magnetic field have changed over time. Earth’s magnetic field has completely reversed direction every million years or so. The different colored layers in Figure 14 indicate the directions of Earth’s magnetic field over time. Notice that the patterns of bands on either side of the ridge are mirror images. This is because the sea floor spreads apart from the mid-ocean ridge. So rocks farther from the ridge are older than rocks near the ridge. Scientists can determine when the rock was formed by looking at the rock’s magnetic record. Earth’s magnetic field extends into space. Space is not empty. It contains electrically charged particles. Earth’s magnetic field affects the movements of electrically charged particles in space. Those charged particles also affect Earth’s magnetic field. Other electrically charged particles in space come from the sun. Earth and the other objects in our solar system experience a solar wind. The solar wind is a stream of electrically charged particles flowing at high speeds from the sun. The solar wind pushes against Earth’s magnetic field and surrounds the field, as shown in Figure 15. The region of Earth’s magnetic field shaped by the solar wind is called the magnetosphere. 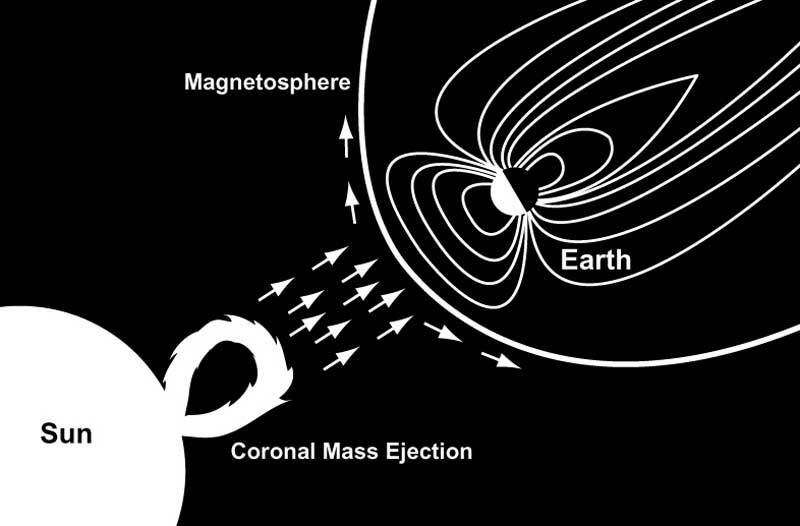 The solar wind constantly reshapes the magnetosphere as Earth rotates on its axis. Although most particles in the solar wind cannot penetrate Earth’s magnetic field, some particles do. They follow Earth’s magnetic field lines to the magnetic poles. At the poles, the magnetic field lines dip down to Earth’s surface. When high-speed, charged particles get close to Earth’s surface, they interact with atoms in the atmosphere. This causes some of the atoms to give off light. The result is one of Earth’s most spectacular displays—a curtain of shimmering bright light in the atmosphere. A glowing region in the atmosphere caused by charged particles from the sun is called an aurora. In the Northern Hemisphere, an aurora is called the Northern Lights, or aurora borealis. In the Southern Hemisphere, it is called the Southern Lights, or aurora australis. A compass is a device that has a magnetized needle that can spin freely. The needle in the compass usually points north. A compass behaves as it does because Earth acts as a giant magnet. Just like a bar magnet, Earth has a magnetic field surrounding it and two magnetic poles. Earth’s magnetic field also acts on rocks that contain magnetic material, such as rock on the ocean floor. This creates a permanent record of Earth’s magnetic field. The strength and direction of Earth’s magnetic field has changed over time. Earth’s magnetic field has completely reversed direction every million years or so. Earth’s magnetic field affects the movements of electrically charged particles in space. Those particles also affect Earth’s magnetic field. Earth and other planets experience a solar wind. The solar wind is a stream of electrically charged particles flowing at high speeds from the sun. The solar wind pushes against Earth’s magnetic field and surrounds the field. The region of Earth’s magnetic field shaped by the solar wind is called the magnetosphere. When charged particles get close to Earth’s surface, they interact with atoms in the atmosphere. This causes the atoms to give off light. A glowing region caused by charged particles from the sun is called an aurora. In the Northern Hemisphere, an aurora is called the Northern Lights.